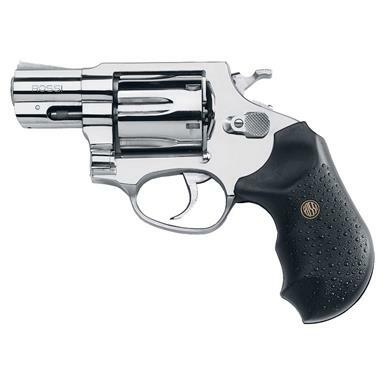 Rossi® 352 .38 Special +P Revolver. Built to the same quality and reliability standards in place at Rossi for over 100 years. The Rossi 352 Revolver's 2" barrel makes it the ideal conceal and carry gun.­ And weighing in at only 1.5 lbs., it's so packable you'll love having it inside your waistband. The deep finger grooves on the grip allow for comfortable extended range sessions, and of course a steady grasp when it counts. The fixed front sight won't snag on your holster, and the trigger pull is smooth and dependable in both single and double stage. When the cards are down, depend on Rossi Revolvers from start to finish.